Pakistan, 19h November 2018: OPPO, the selfie expert and leader has launched its new product under the popular "A series", the "A7". 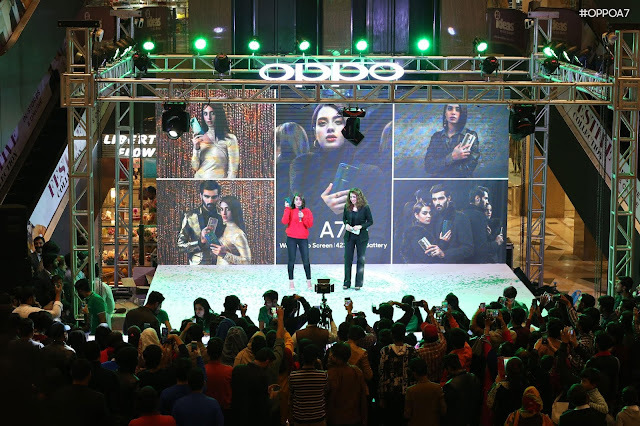 The youth star sensation of Pakistan media industry and product brand ambassador of OPPO A7, Iqra Aziz graced the first sales activity event at Fortress Square Mall of Lahore. The lucky fans who bought the phone got the opportunity to click selfies with Iqra Aziz and got a signed phone from her. With powerful 4230mAh battery, premium design and beautiful water drop notch, A7 is now available in ‘Glaze Blue’ and ‘Glaring Gold’ colors all over Pakistan in an affordable price of PKR 39,999.